This section includes detailed information about the predefined charts in the MOREAL platform. Keep in mind that depending on the user’s role, new types of charts can be defined in the Report Types page. Two sample chart boxes. Closed Sessions over Time (Line Chart) and Allowed Source IPs (Pie Chart). The actual chart. Depending on the type of chart it can be either a line chart or a toggling pie/bar/column chart. Custom filters, with which a user can specify a custom Drill Down Expression that allows the extraction of more specific information relative to the chart. After a Drill In takes place, the option to Drill Out is enabled to get back to the previous state of the chart. 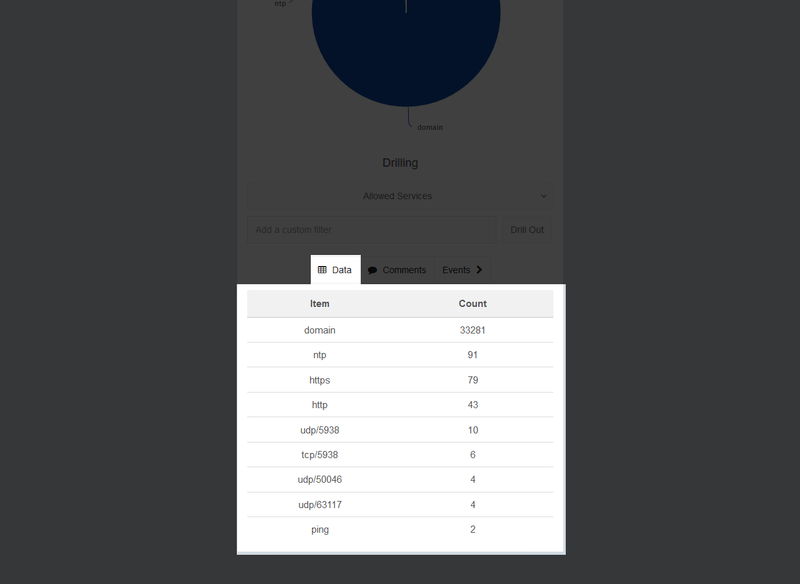 In the toggling pie/bar/column charts you can Drill In by clicking on a point of interest on the chart itself. Chart Comments, where any user can leave comments that other users can review. The comments expand using the comments button that lies below each chart. An Events button that navigates to the Events page, with applied filters that show the Events relative to the current device, chart type, drill down expression and time range. On top of the common shared interface and options, the toggling pie/bar/column charts have additional functionality. The pie/bar/column charts can be toggled using the Cog Icon that is located on the top right of each chart box that allows this function. Above the Custom Filters there are also predefined Drill Down Expressions relative to each chart that can be accessed through an expandable drop-down select box, explained in detail below. Α Data button, that expands to a table that includes information relative to the chart, for more accurate comparison of the data depicted in the chart. From Left to right: Hovering over a chart, Print or Save individual chart to file, Zooming In a chart. When a chart is hovered on with a mouse cursor, more specific information appears in a floating box to give a more accurate representation of the data at that specific data point. Each chart individually can be printed, or saved in PNG, JPEG, PDF or SVG file format. In case line charts are selected, you can zoom In the chart, which essentially narrows the time range of data depicted on the chart. Keep in mind that zooming In a chart alters the master time range and thus, all charts are updated to conform with the new time range. To initiate the zoom In function, use the left mouse button to click on a point on the chart, drag the mouse to a second point in order to mark the range of interest and then release the mouse button. In case any of the toggling pie/bar/column chart is selected, clicking on a point of interest Drills In the chart. 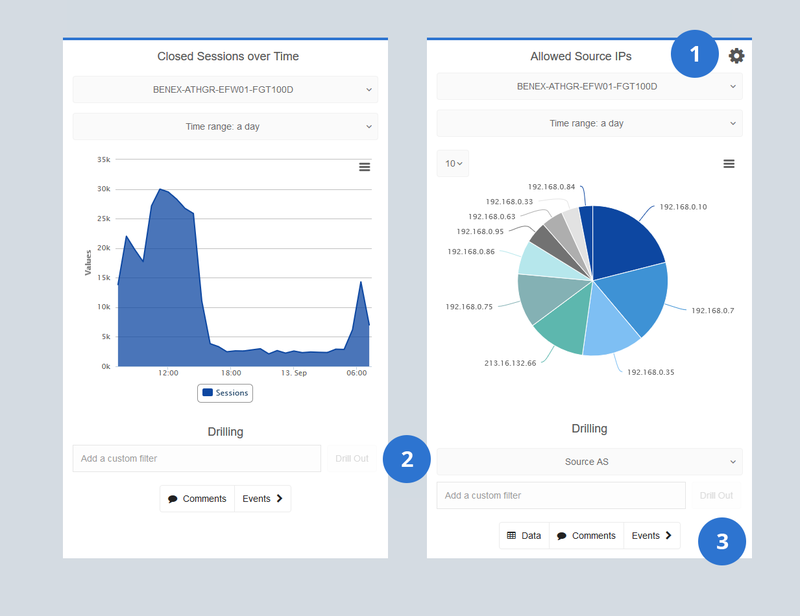 The Allowed Source IPs chart is used as a sample to describe the Drilling In-Out functionality in detail. The same procedure applies for most of the predefined charts found in the MOREAL platform. 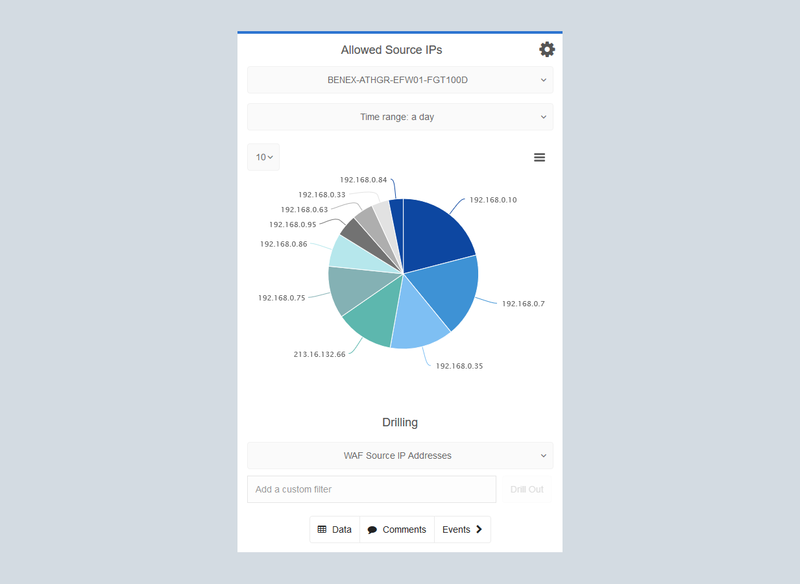 Besides the Custom Filter input box that allows a user to specify a custom Drill Down Expression, this kind of chart provides Drilling In to options by the predefined Drill Down Expressions that can be accessed through an expandable drop-down select box. After having selected a Drill In option, a user can Drill In by clicking on the chart area. 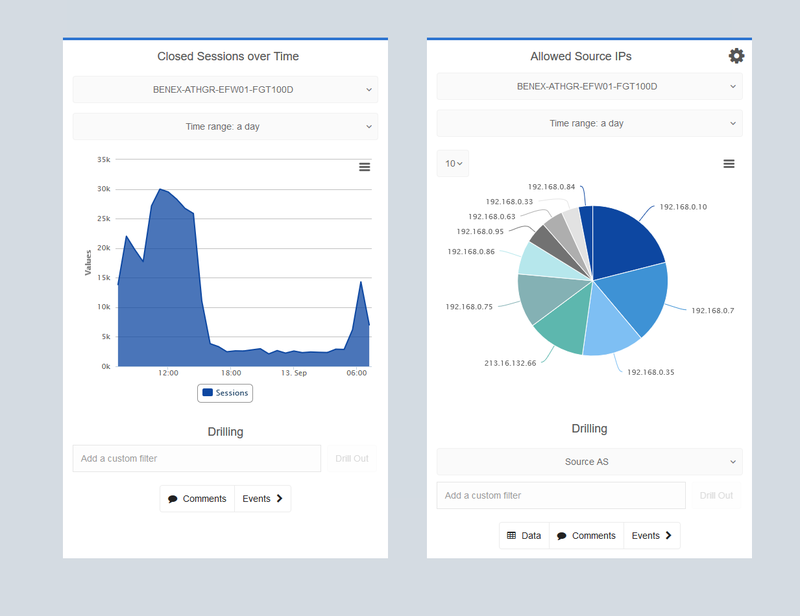 For instance, assume that a user has selected the Allowed Services Drill In option to have a view of the amount of traffic generated by each service that have been used from any given IP. 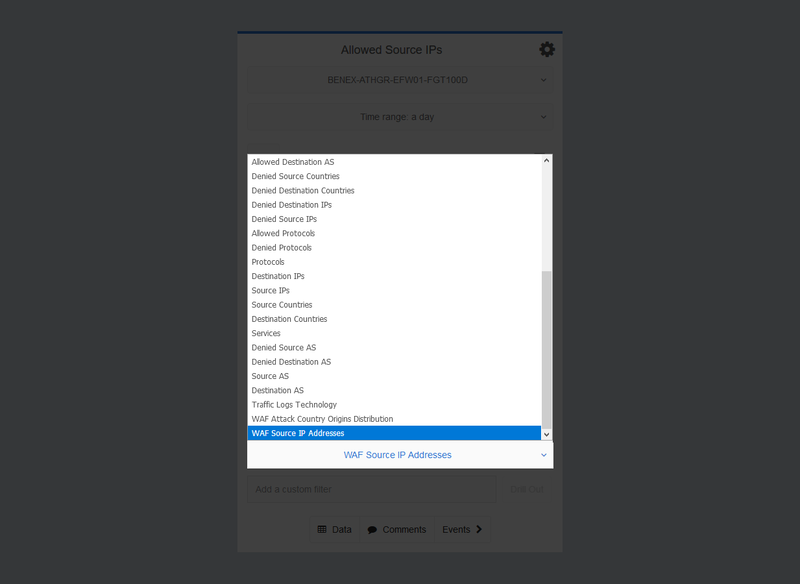 For instance, a user may select to view which services – and how intensively in terms of generated traffic – have been used from an IP by simply clicking on the pie sector labelled with the aforementioned IP address. The result of such a user action is illustrated in the following image. To backtrack to previous chart, the user should use the Drill Out button that becomes active after a user has used a Drill In option. 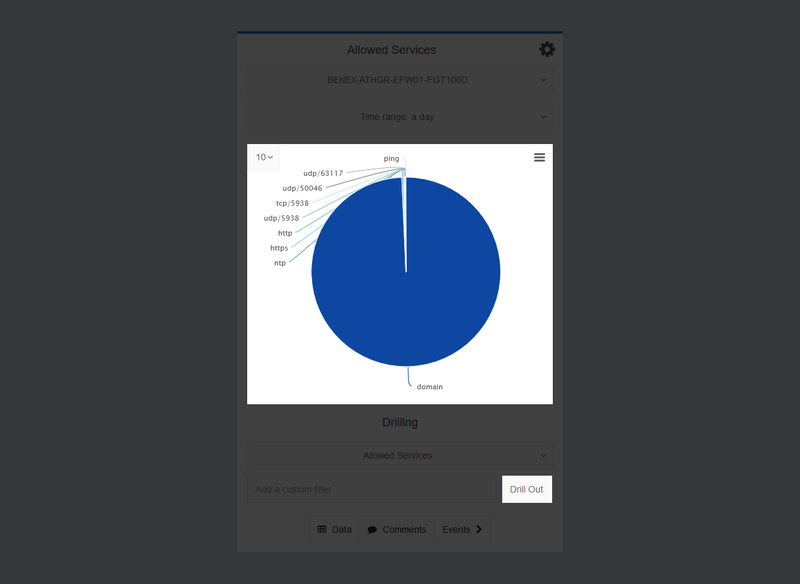 The result chart after a user has selected Allowed Services from the predefined Drill Down Expressions and clicked on an IP on the original chart to Drill In. Notice that the Drill Out button becomes active for use after Drilling In.